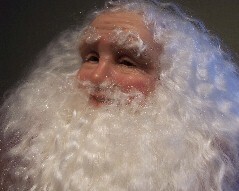 This Large 34" One-of-a-kind Santa has a gentle expression. His head starts out as a ball of tinfoil then prosculpt polymer clay is applied to the foil head handsculpting the facial features. Hands are done the same using a handmade wire armature inside the clay. I use NO molds for any part and NO patterns for their clothing. His green eyes are glass, and he has a angora mohair beard & hair. Santa is dressed in a deep red coat trimmed in brown &tan tipped Fox fur. His pants and hat are done in a deep red tapestry fabric. Hat is also trimmed with the Fox fur. Santa wears brown boots. Accessories include his antique oak rocker with wicker seat 23" high x 12" x 14" seat 20" runners. His feet rest on a handmade foot rest upholstered in red faux suede. 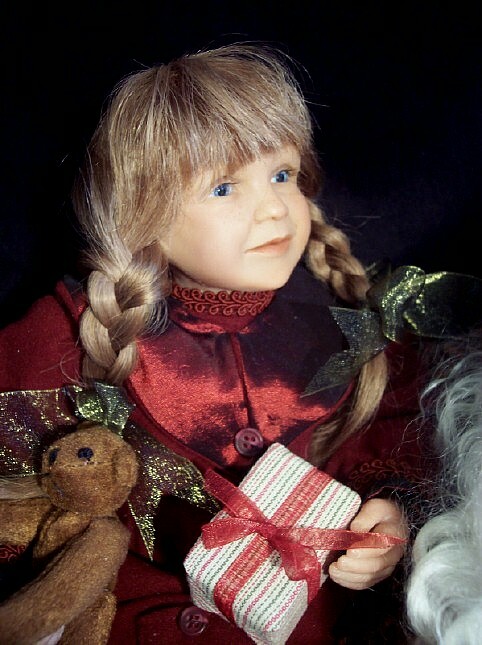 Santa holds a medium brown Boyds bear, antique style doll, and name list. If you want a personalized list, please let me know the names you would like on the list. This One of a kind Father Christmas is approx. 25" tall. His head and hands are hand-sculpted using prosculpt polymer clay. This Santa has very kind blue eyes (made of fade resistant glass). His beard & hair is made of white angora mohair. Santa is wearing a long white brocade coat with hood in a beautiful fabric in a white scroll pattern all trimmed with a off-white faux fur. His under-dress is done in white satin fabric with a small imported lace applicate from England at his waist. This Santa has no pants or feet, but a long under-dress. His accessories include a spray of gold leaves and apple with long white/gold edged bow, he also holds a gold star ornament with small gift wrapped in gold paper. This One-of-a-kind Santa is approx. 27"tall if standing. His wooden sled is approx. 21" L. x 14" w. Santa's head, & hands are handsculpted using prosculpt polymer clay. He has glass eyes and angora mohair that has been curled. He has a beautiful wedge-wood blue 100% bulk knit sweater. Coat and hat are trimmed with ivory faux fur. Santa has his blue jeans on and wears fur trimmed hand-made off-white leather boots. Accessories include his wood & metal sled and ivory teddy bear. Santa is still a child at heart and is taking a break from the hectic Christmas rush! This Ethnic Santa is One of a kind and stands 24" tall. His head and hands are hand-sculpted using prosculpt polymer clay. His beard is made of salt & Pepper wool. His coat & hat are made of soft deep red fleece (darker than picture shows) and trimmed with white faux fur. Santa has black pants & boots trimmed with jingle bells. Santa holds a small toy violin, sailboat. Santa stands with his dog "Jingle Bell" a black & white springer spaniel. All Santa's (Below) were commissioned..... and are in private collections. These are some example's of Santa's made using heirloom fur, etc. using your beautiful vintage silver fox fur. These Santa's below were done for Mary S. using her Mothers heirloom coats and furs. fur coat lining as trim.